HHS Secretary Alex Azar and his top lieutenants marked the first 100 days of their drug pricing blueprint with a report they said showed the plan has curbed pharmaceutical costs. Compared with the same time period last year, the report said there have been 60% fewer brand drug price increases and 54% more generic and brand drug price decreases since the Trump administration's drug pricing strategy was laid out in May. "It's unprecedented to ever see any action like that," said John O'Brien, adviser to the secretary for healthcare policy, in a Monday call with reporters. "We are tracking from the day of the launch of the blueprint up to Aug. 15, and we see a direct correlation to the blueprint." The HHS analysis did not break down the magnitude of the drug price increases that did occur, nor did officials compare those increases to last year's. The report by Dan Best, Azar's senior adviser on drug pricing reform, did not cite data to support the numbers. Azar has found himself defending the administration's blueprint against Washington skepticism, and he heralded these numbers as the start of a major change. "The pharmaceutical industry has responded with real changes, not out of altruism but because they're skating to where they see the puck going," Azar said. He emphasized that 15 companies offered concessions on the pricing front this summer. In July, Pfizer said it would delay planned increases until the blueprint was fully implemented, and Merck announced it would lower the price of a hepatitis C drug by 60% and cut prices of six older drugs with low sales volume by 10%. Thirteen additional manufacturers have promised to freeze increases for the rest of the calendar year and four have canceled planned hikes. Azar also called on Congress to act, specifically on the blueprint's core plan to merge Medicare Parts B and D to allow negotiations for Part B. He plugged a bill against so-called gag-clauses by lawmakers including Sens. Susan Collins (R-Maine), Bill Cassidy (R-La. ), Claire McCaskill (D-Mo.) and Debbie Stabenow (D-Mich.). The legislation would block insurers from instructing pharmacists not to tell consumers if they could buy a drug that would be cheaper out-of-pocket than under their plan. But he emphasized that he wants to see more action from the drug supply chain, noting that "nothing is stopping" pharmacy benefit managers from revamping their business model of guaranteed rebate structures or drugmakers from revealing drug prices in their advertisements. 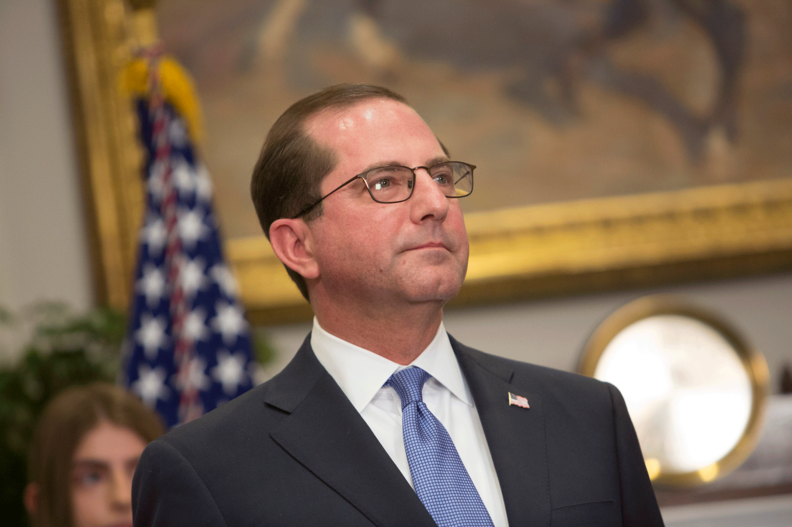 Azar has promised to roll out demonstrations to push policies such as the integration of Medicare Parts B and D to drive more price negotiation, but officials didn't provide a timeline for any announcements.